Applications: Leather sofas, Saddles, Furniture, Automotive upholstery, Car seat covers, Sails, Parachutes, Tents, tarps, awnings, saddles, buffing wheels, polishing wheels, lifting slings, rigging products, safety belts, hoists, safety harness, textile slings, lanyards, synthetic webbing, bulky quilting & beds etc. 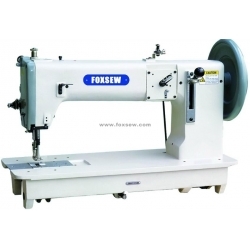 Features: This model is a giant of FOXSEW brand heavy series, featuring compound feed mechanism and flat bed. The large Barrel shuttle has been specially designed for processing the extreme thick thread, particularly suited for hand crafted upholstery, shoes, leather goods, car seats and steering wheel covers; The compound feeding system enables you to sew multiple ply of heavy weight material with even stitch; Excellent climbing properties and high needle penetration power guarantee easy sewing thick spots or overlapping cross seams, without skipped stitch, loose bottom thread,shorten stitch length and bobbin thread Knots; Up to 12 mm long stitches for decorative top stitching seams; Thread puller is available. 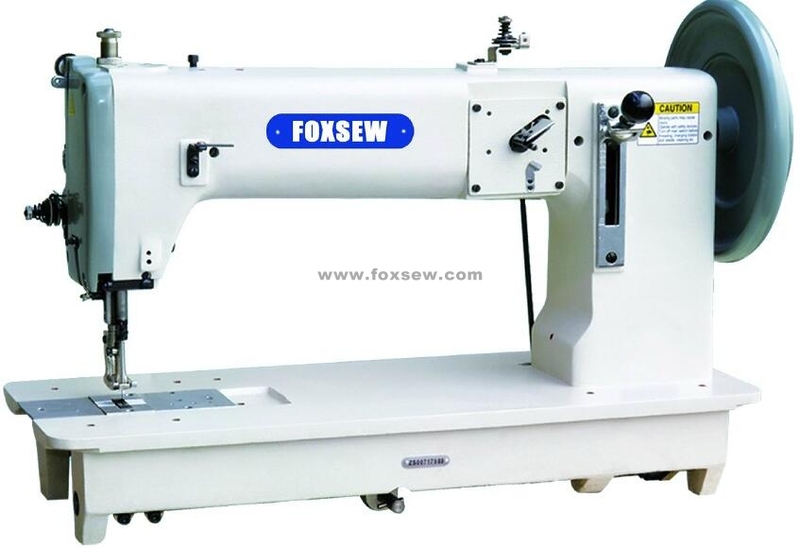 Its powerful and steady feeding enables you to sew multiply heavy weight material with nice and beautiful stitches easily. The imported special large shuttle hook and large bobbin capacity offers high efficiency in sewing production. The bobbin winder is on top of the machine head and the presser foot lift can be up to 20MM. Its application covers the stitching of handles of handbags, baseball, gloves, sports apparatus, safety bags, tents, seat cushions, sofa, suitcases and bags, and other heavy duty or extra heavy duty work.